Tokyo, Japan, 2019-Feb-12 — /Travel PR News/ — Aeroméxico, Mexico’s global airline, continues to implement its expansion strategy to offer customers new cities and horizons to increasingly distant destinations. On this occasion, Aeroméxico will start to work with its partner Japan Airlines on the operation and marketing of service to more than 20 cities in Japan through their new codeshare agreement. 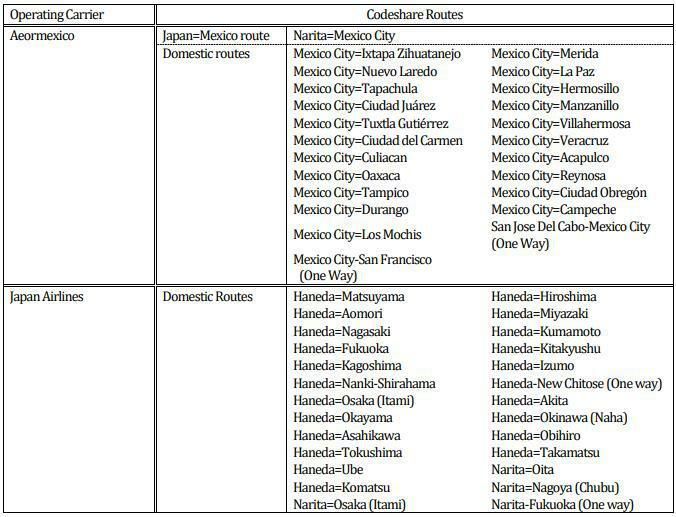 As of February 13, 2019, Aeroméxico customers will have the option to choose to fly on the company’s direct daily flight between Mexico City and Narita Airport in Tokyo, continuing on to points beyond Tokyo with quick and easy flight connections on Japan Airlines` extensive route network throughout Asia. Thanks to the new codeshare agreement, Aeroméxico will improve connectivity to major business centers in Japan, such as Hiroshima, Osaka, and Sapporo, opening the door for our customers to discover the charm of ancestral cities like Nagasaki, Oita, Okinawa, and Ube, among others. Japan Airlines, on the other hand, will be able to offer customers access to increased connectivity to 30 destinations in Mexico. Aeroméxico continues to consolidate its position with its 12 years of experience flying to Japan from Mexico as the only airline in Latin America to serve the Far East thanks to Japan Airlines, one of the best and most experienced airlines in the world. Economic trade between both countries has been on the rise in recent years. There are nearly 1,180 Japanese companies with operations in Mexico, and at the end of 2017, Mexico reported USD 11.2 million in imports from Japan, with USD 5.7 million in exports, according to the latest information available. The growth rate of Japanese passengers traveling to Mexico has also been on the rise. According to information published by the Mexican Government, a total of 140,363 passengers from the Asian country entered Mexico by air between January and November 2018, representing a 3.7% increase year over year. Japan, with its deep traditions dating back thousands of years, where the ancient and modern meet, represents a unique tourist option for travelers from Mexico, who must be sure to visit Tokyo, the nation’s current capital or Kyoto, which was a capital city for more than 1,000 years and is famous for its extraordinary shrines and temples. Other must-see destinations for nature lovers include Mount Fuji and Mount Komagatake, as well as ski destinations like Niseko in Hokkaido. Aeroméxico thus offers customers from Mexico increasingly ample possibilities to travel the world, either to the 90 domestic and international destinations that it serves directly or to the more than 1,150 destinations that the company offers through its partner airlines. This entry was posted in Airlines, Airports, Business, Flights, Travel, Travel Management, Travel Services, Travelers and tagged Aeroméxico, codeshare agreement, flights, Japan Airlines. Bookmark the permalink.